Anahuac is a Nahuatl (Aztec) word that means Land Between the Waters. The term has been used to describe the Valley of Mexico where the Aztecs built their capital city and where Mexico City now stands, but Anahuac was the name the Aztecs used to describe all of the land they inhabited and including the whole continent. Today Anahuac can be used to described the whole of the New World, North and South America. Indigenous nations, including the Aztecs, did not have flags as we have today, but they used military banners and other iconography as demonstrated in surviving codices and murals. The Aztecs had a wide range of symbology and myths that they incorporated in the place names of their cities and sacred sites. The legend of the founding of Mexico City is used in the flag of Mexico, with the eagle eating a serpent on top of a cactus. 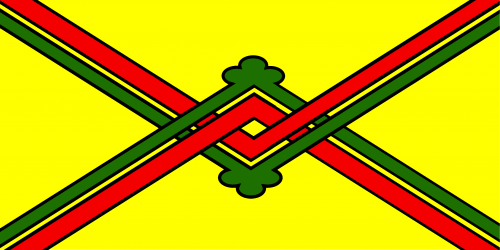 Since, modern flags were not used in the time of the Aztecs I tasked myself with designing flags using the symbolism the indigenous people of the Americas would have used. 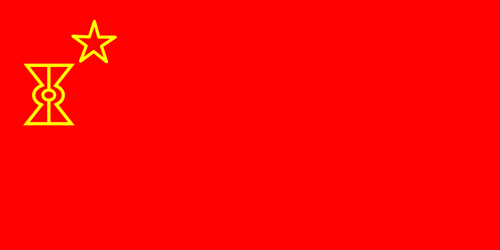 This flag is modeled after the flag of the USSR but a variant of the ollin symbol. This flag design uses a variant of the ollin symbol in the style of a saltire like the Cross of Saint Andrew. 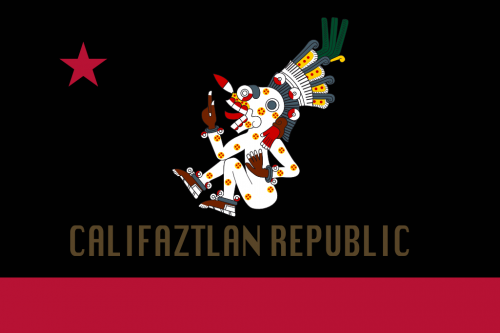 The following flag design is based on the flag of California but uses the image of Aztec gods in the badge. 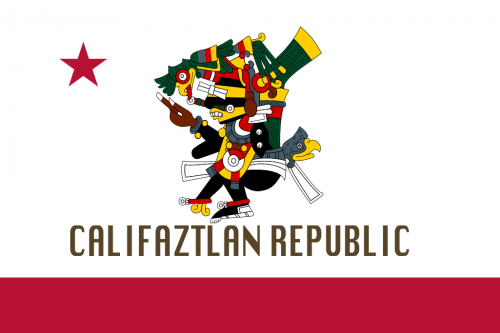 The word Califaztlan is composed of California and Aztlan, the ancestral home of the Aztecs that is said to be located in the American Southwest. This is a redesign and remix of the flag of the Americas (also known as the flag of the Hispanic People, Bandera de la Hispanidad) and the Cross of Burgundy. The Cross of Burgundy flag was used by the Spanish in its overseas territories for nearly three hundred years, from the American Southwest to la Tierra del Fuego. 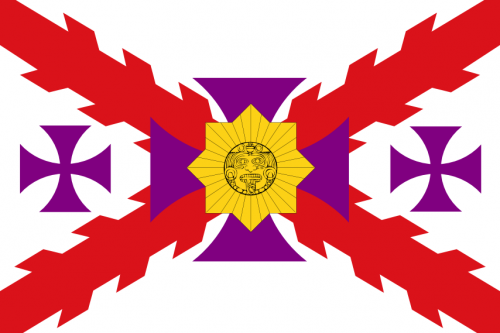 The three purple represent the three ships used by Columbus to discover the New World, it also represents the idea of the three cultures (the European, the indigenous peoples of the Americas, and the modern Raza Cósmica). The sun represents the Aztec sun god Tonatiuh and the Incan sun god Inti. In an interview with Joe Rogan (the Joe Rogan Experience #221), Shane Smith said that the Pashtuns of Pakistan have a saying that translates to the following: There is a tiger above me and a river below me. I’ve heard a Spanish version of this saying which I translate as: Between the wall and the sword. And of course, in the United States we have a similar saying that describes the same sentiment: Between a rock and a hard place. The above sayings are examples that no matter the language or metaphor people are much more a like that we like to think.